We are pleased to present this month's Student and Postdoc Symposium; chaired by SD-CAB Director, Dr. Stephen Mayfield. 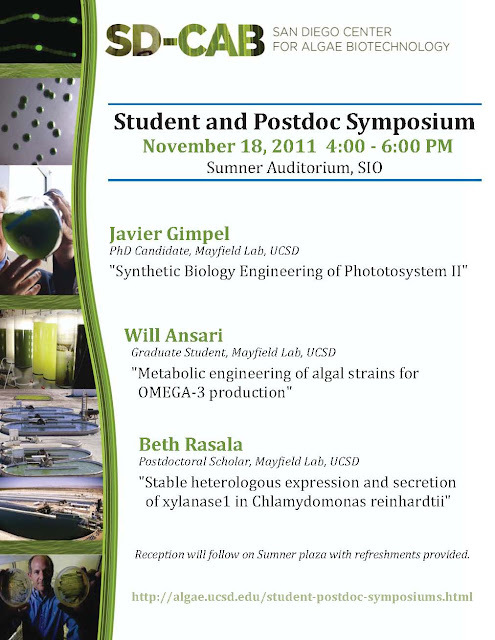 Javier Gimple: "Synthetic Biology Engineering of Phototosystem II"
William Ansari: "Metabolic engineering of algal strains for OMEGA-3 production"
Beth Rasala: "Stable heterologous expression and secretion of xylanase1 in Chlamydomonas reinhardtii"
Where: Sumner Auditorium on the SIO campus (look for the Argo bell). Visitors should park along La Jolla Shores Dr.
A poster for this event is attached. Please feel free to share it with your friends, co-workers and post it in your buildings to help us spread the word.